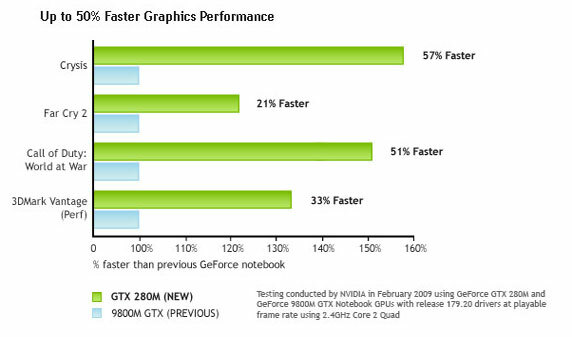 NVIDIA® GeForce® GTX 485M delivers an awesome gaming experience and is the highest performing notebook GPU in the world. NVIDIA GeForce GTX 485M, provides the ultimate notebook gaming experience. © 2010 Square Enix Ltd. Published by Suare Eniz, Inc.
Metro 2033™ © 2010 THQ Inc. All rights reserved. All trademarks are the property of their respective owners. So fast you'll forget it's a notebook. NVIDIA® GeForce®-powered notebooks pack awesome graphics performance into a mobile package, making them the perfect choice to experience blazing fast frame rates on graphically demanding games like Metro 2033, Battlefield: Bad Company 2, and Just Cause 2. Featuring NVIDIA® PhysX™ technology for hyper-realistic game play and physical effects, these GPUs are the ultimate mobile solution for hard-core gamers, not to mention video editors and photographers. Why settle for a sub-par notebook when you could own one with the graphics mojo to destroy your opponents any place, any time? Bigger is not always better when it comes to your notebook – now you don’t need to sacrifice your game to play the game. With more GeForce power per-square-inch than ever before, the amount of gaming horsepower available in a thin notebook is astounding. .
Sure, with your GeForce-powered notebook you can game anywhere, but with a mighty pixel-pushing GPU – why not unleash it on a Big Screen? Turn your notebook into a desktop in seconds, and get more use out of that eye-pleasing LED Display or HDTV at the same time. The gaming options are unlimited: Flight Sim yourself to oblivion with the cockpit window on the Big Screen and instrument panel on your notebook. Show-off your World in Conflict skills on one screen, and strategize your plan of attack viewing the map on another – all is fair in love and war. . Or take it a step further and hook up to a 3D Vision ready monitor to play games and view movies or photos in 3D at incredible depth. World in Conflict: Soviet Assault image captured on NVIDIA GPU. Provided by Massive Entertainment. Whether you're a LAN-party fanatic or just prefer to annihilate the enemy in person, now it's easier than ever to head over to your "friend's" place with a GeForce-powered notebook as your weapon - and make him wish he'd practiced a bit more. Got a group of gamers? Huddle up, order a few pizzas, skip the set-up time and back-ache, and still blow them out of the water. © 2009 EA Digital Illusions CA AB. All rights reserved. NVIDIA® Verde™ software provides regular software updates to keep your notebook compatible with the latest applications and games and performing at its peak. Includes support for manufacturer hotkeys, so you won't lose any of your notebook specific settings. It’s not only about gaming performance, it's also about compatibility and reliability. With NVIDIA’s The Way It’s Meant To Be Played™ program you get the Ultimate "Install and Play" Experience. That's why today's hottest games are developed on NVIDIA, to be played on NVIDIA. NVIDIA’s multiple communities enable you to get the most out of your GeForce GPU. in.nZone.com is all about content -it’s the premier destination for GPU-enabled games, applications, and enhancements. in.SLIzone.com is dedicated to all things SLI - enthusiast forums, blogs, and educational and technical information. Ultimate Notebook Gaming, bar none - extreme resolution, extreme FPS. Sacrifice nothing in the name of gaming glory.